The Coast Survey, for whom Cluss worked when he first arrived in Washington (see Career and Profession), had occupied a number of "dilapidated" buildings on the hill on the south side of the Capitol. In 1870-71, Cluss planned four new brick buildings between New Jersey Avenue and South Capitol Street SE. 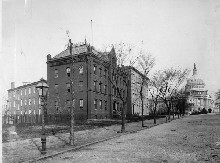 Two five-story buildings dominated the site, one facing New Jersey Avenue, known as the Main Building, and the other facing South Capitol Street, called the Back Building. Brick stairs and walkways connected the two buildings. 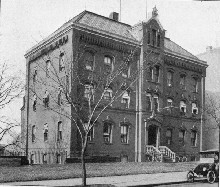 Because of the hill, two stories of the Main Building were underground on the New Jersey Avenue side. 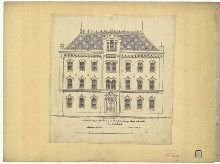 Even with that modification, the Main Building was still the taller of the two buildings. In both buildings, elevators connected all the floors. A two-story building and a one story building on the north and south boundaries of the site occupied most of the remaining space. Like his previous federal government building for the Agriculture Department (12), Cluss designed the Main Building, the major public face of the Coast Survey complex, using Rundbogenstil, or rounded arch style. Together with its red brick walls with brown stone trim, and its red, blue, and green patterned slate roof, the Coast Survey headquarters contrasted sharply with the nearby classically-styled Capitol Building and earlier government buildings such as the Treasury, Post Office, War, and State departments and the Patent Office. Coast Survey yearly expeditions charted and mapped coast lines and gathered information about ocean currents and tides. Its publications included beautiful maps printed at the New Jersey Avenue headquarters. Until the Twentieth century the Survey also established standards for all United States weights and measurements. By 1879, it assumed more continental responsibilities and it reorganized as the Coast and Geodetic Survey. In 1929, the federal government moved the agency to the new Department of Commerce building in the Federal Triangle (between Pennsylvania and Constitution Avenues and Fourteenth and Sixth streets NW). After demolition of the Coast Survey buildings, the U.S. Congress claimed the site for the Longworth office building for members of the House of Representatives.